A number of law firm leaders have expressed concerns to me regarding what they perceive to be a lack of quality and qualified candidates for the most senior law firm marketing positions, such as chief marketing officer or chief business development officer. It's certainly plausible that some candidates who rose to senior-level law firm positions during times of plenty now face a daunting task of adapting to a much more competitive market. But it's also clear that many law firm leaders have a poor understanding of the kind of marketing support they need, so they are unable to distinguish between suitable and unsuitable candidates. This, added to the poor processes many pursue to find candidates, means that too often we end up with mixed results. In my roles as both a consultant to law firm leaders and as 2014 president of the international Legal Marketing Association, I've captured the following recommendations to improve the process. Law firm growth plans typically lack specific financial targets and a clear market vision. Like a golfer who studies his swing, law firm leaders should strive to be "consciously competent." Why are we successful, what ingredients have led to our success, what factors have changed, what should do more, what should we stop doing? Marketing is about deeply understanding these issues and then marshaling the necessary resources to pursue a well-designed plan. How can we possibly find the right champion if we don't know where we are, or where we're going? Be honest and clear about your vision and who will best help you pursue that vision. If you need to generate new business, why are you interviewing candidates whose expertise is in promotions and communications rather than in business development? If you struggle to achieve recognition in a crowded market, seek candidates with experience in branding and differentiation rather than coaching. In many law firms, there is more than one vision. Different practices, and even different offices, have achieved different levels of brand awareness and credibility. It's extraordinarily unlikely that in all markets, for all practices, your firm is perceived the same by all clients. All diverse businesses face this challenge and a good business strategy recognizes and incorporates these variations. However, if your firm has a disaggregated approach, allowing practices and partners to determine and pursue whatever go-to market strategies and tactics suit them, then your marketing leader needs a very different skill set than the firm with a very rigorous, disciplined and consistent approach. If the executive committee can't reach agreement on a vision and strategy, let alone what skills and competencies are necessary for a senior marketing leader, and if you also allow partners to independently determine what they expect from marketing, understand that you have already limited your new CMO's effectiveness. Law firm leaders need to be clear and consistent in describing the skills and competencies for their most senior marketing leader. The hiring process for a chief marketing officer can be onerous, in part because many firms have too many stakeholders participating in the hiring process. Obviously, any senior marketer will need to interact with a large number of colleagues so it's important to see a cross-section of the firm, but it's unrealistic and impractical—even in the smaller firms—to try to assuage everyone's ego by involving them in a process that wastes time. Firms should employ a rigorous approach to capturing feedback that maps the necessary skills and competencies to the position description, provides appropriate questions to guide the interviewer to examine these credentials, and provides a scoring tool to ensure consistency in feedback. In some firms, the opposite approach prevails and not enough people are involved in the hiring process. A strong leader, or a small group of leaders, pursues the search in isolation, crafting the position description and conducting all interviews, and sharing the results only when a candidate is hired. The trouble with this process is that it can work ... to a point. But by not including enough stakeholders in the process, the new CMO risks having his or her success rise or fall with that leader's political profile, rather than on individual accomplishments. It's quite common for a new law firm leader to seek a new chief marketing officer, especially one with whom he or she can find the right chemistry. Chemistry is important, of course, but senior marketing leaders, like any senior business professionals, aren't nearly as effective if their authority comes from aligning with a champion than from their credentials and contributions. Law firms benefit when critical business decisions are shared among the senior executives rather than limited to a select few. It's important to strike the right balance of interviewers, both to secure buy-in and to capture robust feedback. Some law firms pursue growth, any growth whatsoever, by pursuing new clients and cross-selling existing clients, by expanding the practice mix and adding laterals and acquisitions. With such a broad range of growth options, all deemed equally necessary by the stakeholders involved, it's quite challenging to prioritize when allocating insufficient marketing resources, time, and funds. Hiring more people isn't usually the answer, so instead we recruit heroes to swoop in and save the day with a superhuman effort again and again. These people inevitably burn out. Heroes spend their days shuffling and then re-shuffling the pool of limited resources to ensure that today's crisis is handled while tomorrow's crisis is held at bay. The team is substantially focused on responding to a barrage of incoming requests, some of which are consistent with the strategic plan, some not so much. Too rarely are these heroes allowed to say no. Hero culture is what many businesses fall into when they lack sustainable business processes. So when hiring a CMO, law firm leaders should ask candidates how they'd measure not just the ROI of marketing investments, but how they'd collaborate with other firm leaders to better understand and re-prioritize all of the firm's investments. If you rely on heroes to get through every day, your business processes are probably broken. Hero cultures often gain prominence in organizations that value independence, as there are few incentives to work across boundaries for the good of the organization. In many law firms, partners are given wide latitude to manage their books of business as they see fit. The prevailing outcome, then, no matter what the strategy document contains, is that the highest purpose of the firm and its professionals support staff is to tend to the needs of the partners. This is a terrible business strategy. The best organizations perform well when everyone is focused on the same outcome, and follows a coordinated plan for achieving the same outcome. If the spoken or unspoken rule in your firm is that the business professionals must respond to every partner demand without question, then you should either change the culture or be sure to hire a CMO who thrives in this environment. If your primary objective for the marketing function is not to improve the firm's financial performance but instead to hire people who won't "rock the boat," then hire accordingly. But you must also own the results. If the law firm leaders fail to lead, those tasked with execution will also fail. A recent survey of leading marketing professionals from a variety of fields revealed a surprising number of senior law firm marketers who have little interaction with clients, and no formal client feedback program in place. By contrast, marketing professionals from other industries claim to have a deep understanding of their client's business needs, buying approach and buying personas, and regular interaction and visibility with clients. If client satisfaction matters to your firm—and it should—then recruit a CMO who has deep experience with your clients, or who has a successful methodology for discovering this. If you claim to be client-focused but won't allow the CMO to interact with clients, then stop pretending that client satisfaction matters. The legal marketplace has changed and there are some senior marketers who struggle with these changes, just as there are junior marketers climbing the ranks or entering the legal profession with excellent new ideas. Too, there are well-credentialed newcomers to legal marketing who struggle adapting to the curious law firm culture, and legal marketing veterans who are skilled at getting things done. It's critical to find the right professional to fit your law firm's needs. The breadth of skills and competencies among marketing professionals is at least as varied as among lawyers. Different skills and competencies suit different firm cultures, market positions and leadership styles. A marketing professional may introduce ideas and concepts and processes that take some getting used to. But if you make the right hiring choice, foster an environment conducive to success, and then measure results, you're going to like the result. 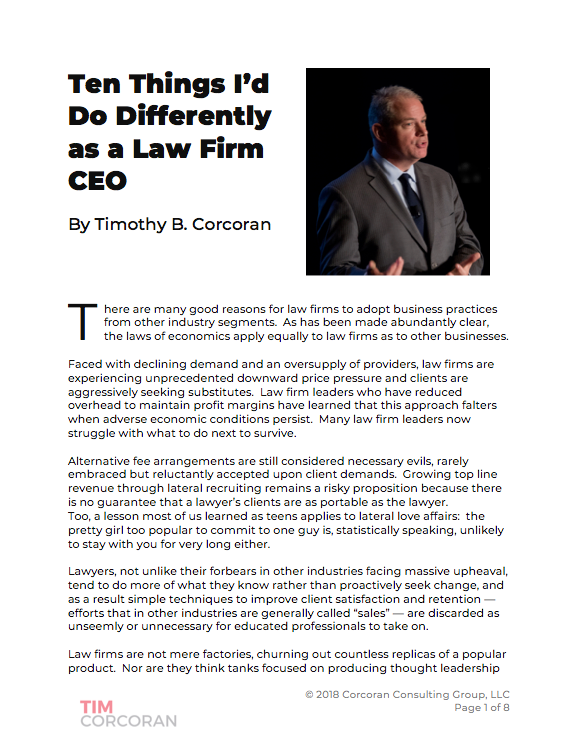 Timothy B. Corcoran is the immediate past President of the Legal Marketing Association and an elected Fellow of the College of Law Practice Management. He delivers keynote presentations, conducts workshops, and advises leaders of law firms, in-house legal departments, and legal service providers on how to profit in a time of great change. To inquire about his services, contact him at +1.609.557.7311 or at tim@corcoranconsultinggroup.com. Note: A version of this article first appeared in the Legal Intelligencer. Reprinted with permission.